The term ‘celebrating’ Halloween, may be in itself, a contradiction, in that some people feel uncomfortable with marking this tradition in such a way. Others might feel that whilst ghouls, ghosts and things that go bump in the night are OK for adults, they are certainly not for the likes of little children. Nevertheless, there is a growing trend for even very little children to dress up, be invited to Halloween parties or to hollow out pumpkins, and whether we like it or not, the UK is fast following the US in entering into the ‘Trick or Treat’ tradition with virtually every high street shop stocking Halloween outfits right from September. For this reason, the nursery may have some responsibility in explaining what happens on 31st October and that if children see scary characters walking about, there is nothing to be worried about. On top of this, many children love the idea of being just a little bit scared (within safe boundaries), and may often clamour to be told a scary story! So how does a nursery mark the occasion of Halloween as an Autumnal festival without offending parents or causing any anxiety in children? As with all activities at nursery, an open policy is the best option and the more information that is shared with parents, the better. If doing Halloween-themed projects with the children may cause concern, parents should be kept informed of what is being planned, so there is time to make alternative arrangements for that child. 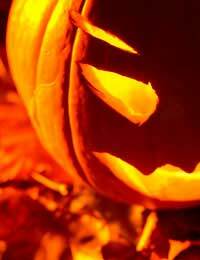 The last thing you wish to do is to alarm young children, so if choosing to celebrate Halloween at nursery, it is important to keep the tone very light, friendly and comforting. Perhaps tell the children that on the last day of October, some people like to tell each other spooky stories and dress up in costumes but emphasise that its all just a bit of fun. If any of the children seem worried, they should be reassured that they are completely safe, and the nursery Manager should consider changing topic. Leaders can ask the children themselves what they already know of Halloween, and see what they say. Many will have spotted Halloween costumes being sold in supermarkets, or might have seen older brothers and sisters dressing up. Then a discussion could follow about the sorts of characters which might be associated with Halloween and a list drawn up. It is worthwhile Remembering, that if they aren’t keen on images of witches, skeletons or ghosts, there are plenty of other ‘emblems’ such as spiders, black cats and bats to choose from. As creatures, these are more familiar to the children and may be less threatening. Carving out a pumpkin lantern can be a wonderful activity to do with children, and does not have to be made with a scary face. They are just as effective carved with patterns, the child’s name, or smiling faces and the children may like the alternative idea of the pumpkins bringing light into the dark night. Another fun activity for the children is to decorate their own special Halloween treats, using writing icing to draw wiggly spider’s webs on biscuits or moulding marzipan cats, bats and witches hats to sit on top of cakes. They can then take them home, and even give them out if they have any Trick or Treaters knocking at the door. Halloween can be a great time to fire young imaginations! As such, it is a fantastic opportunity to do really good work with words, helping the children to write and illustrate poems, prose and stories by exploring feelings and vocabulary surrounding the event. Above all, in celebrating Halloween with nursery children, the priority must be to remain sensitive to their feelings at all times, as well as those of the parents, and a good time should be had by all!